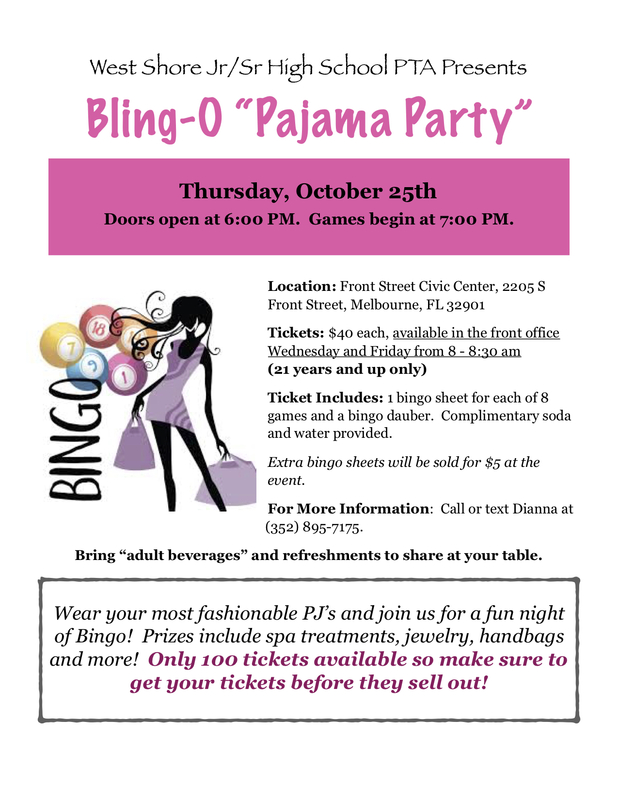 The West Shore PTA Bling-o Pajama Party is right around the corner and there are only two tables left! Be sure to get your girlfriends together and book your table before it’s too late. If you have reserved a ticket already, please be sure to pay this week. If you are unable to make it to during the ticket sale times, please mail a check made out to West Shore PTA to 649 Hummingbird Drive, Indialantic, FL 32903. We have lots of great prizes donated by fabulous businesses and West Shore families. It’s going to be a super fun night you don’t want to miss! If you have any questions please contact Dianna at 352-895-7175.